Do you like Luang Prabang? 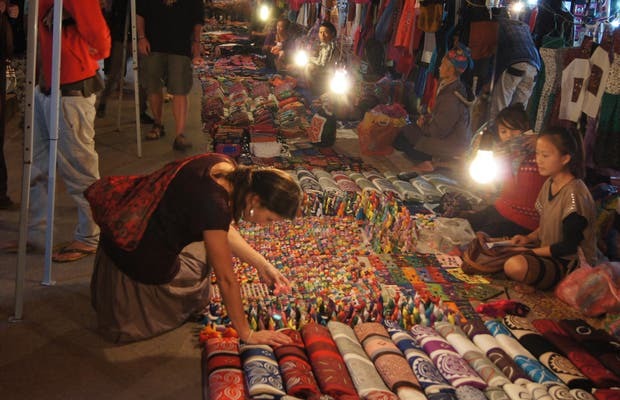 One of the most touristy places in Luang Prabang is the night market . It is on the main street every day. This is a market where they sell all the traditional products of Laotians, handbags, purses, to hand made fabrics or all types of sculptures and items. From 6 in the afternoon, the traders start to ride their posts, consisting of stalls with sheets on the ground so as not to stain anything. Each station has a tiny bulb and then all positions are linked by lighting. The result of these lights is a laidback environment that encourages you to walk around. As is installed, the market fills up quickly and it is hard to walk without tripping, as the streets of posts are always full of buyers.